Spoiler season for Battle for Zendikar is well underway, and even with only a few dozen cards spoiled, we already have at least five new confirmed Eldrazi Commons. As a creature type, the Eldrazi Commons were almost all uniformly playable or good in Zendikar block, with Ulamog's Crusher even seeing play in Classic Pauper from time to time. Thus, as soon as Battle for Zendikar was announced, I was excited to see if their successors would prove to be equally viable in Standard Pauper. So I thought I would take a couple posts this week to look at these new Eldrazi and offer some initial thoughts on how good they could be after Standard rotates this fall. 1. Dominator Drone was among the first cards spoiled for the set, and it introduces us to not one but two new mechanics for the set. Devoid is flavorful but not particularly relevant most of the time, since it simply reinforces that these are colorless creatures despite the colored mana in their cost. Ingest, on the other hand, creates a whole new twist on the milling win condition, since each time it deals damage to an opponent it also exiles the top card of that opponent's library. 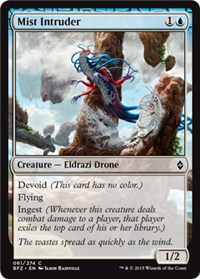 And if that weren't enough, this drone also deals 2 damage to your opponent as long as you have another colorless creature in play. All that, and a decent 3/2 stat line for 2B, should be enough for this to see play. 2. Mist Intruder seems cut from the same cloth as the previous card, but despite having evasion it seems much less interesting. This card immediately reminded me of Fetid Imp, a similar creature in Black that has activated Deathtouch rather than the twin Devoid and Ingest mechanics. In a deck that is actively trying to actually mill your opponent out of cards, this is certainly a better choice than the Dominator Drone, since Flying means it will actually deal more damage over the long run. Additionally, if there are other Eldrazi that convey significant advantages if you having other colorless creatures in play, the value of this card certainly would go up. But outside of those two conditions, this is otherwise a pretty mediocre card. 3. Incubator Drone is virtually an analog for Kozilek's Predator from Rise of the Eldrazi, although I suspect this will prove to be somewhat of a disappointment in comparison. For the same converted mana cost, you get one less point of Power in the creature itself, and only a single token instead of two. Of course, it's worth noting that these are not 0/1 Eldrazi Spawn, but 1/1 Eldrawn Scions, which still retain the ability to be sacrificed for colorless mana. In effect, then, you're getting 3 Power and 4 Toughness for 4 mana, with the ability to trade off a point of each for a single colorless mana. I would evaluate that as definitely worse than Kozilek's Predator, but not substantially so. As such, this should see play. So what do you guys think of these new Eldrazi?